When Swedish drummer Martin Lopez (ex-OPETH, AMON AMARTH) joined forces with metal bassist extraordinaire Steve DiGiorgio (SADUS, TESTAMENT, DEATH, ICED EARTH), vocalist Joel Ekelöf and guitarist Kim Platbarzdis in a brand new project called SOEN, it was obvious that this collaboration would not be just another name-dropping, substance-deprived “super project”. Martin Lopez has described the band’s music as “melodic, heavy, intricate and different.” Even then, Lopez may be selling his band short. SOEN is, in a word, unique. The foursome paint their musical canvas with broad strokes that on first listen may appear gray and sullen, but the true power of the music lies clandestine, just a little below the monochrome surface. More than just a sum of is rather esteemed parts, SOEN weave an intricate network of melodies and lull the listener submerged in a bliss of melancholy. 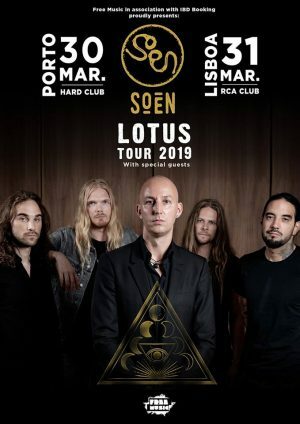 Yes, at times Soen may resemble the Opeth of old, but it makes more of less, as it features none of the guttural vocals and full-on death metal wall of sound of Lopez’ former group. But nothing more is needed when Ekelöf’s somber voice, Platbarzdis’s transcendent guitar work, Lopez’s trademark drum beats and DiGiorgio’s exquisite bass lines collaborate to build a pensive tide, just waiting to wash over you. “Cognitive” sure isn’t an instantaneously accessible album but with a bit of listener patience, it can prove to be one of the most rewarding pieces of “thinking man’s metal” you will ever come across. In a world full of super-compressed albums waging the loudness war, “Cognitive” breathes with ease thanks to the masterful mixing work of David Bottrill (Tool, Smashing Pumpkins, Muse etc.). Like rain on a windowpane; translucent and free of form, “Cognitive” breathes like a living entity. The colors are there, lingering within the grays. It’s just up to you to find them. 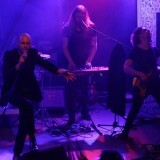 Soen was initially formed by Martin Lopez and Kim Platbarzdis in 2004. Due to a number of reasons Soen was put on ice, to be resumed with the arrival of Joel Ekelöf in early 2010. Later on in 2010, Steve DiGiorgio was recruited on bass and the band’s line-up was finally complete.